The subject of education and careers has been on the forefront of discussion in America in recent times. Young adults trying to find their way are faced with enormous decisions about where, when, and how to get started on a career path that will satisfy their goals. Some choose higher education, while others get started in a trade. From a very young age I knew that I loved working with sheep. I did many other odd jobs as a pre teen and teenager, but my passion was always with animal husbandry. In a way, I didn’t choose to be a full-time sheep shearer; one sheep at a time, and one new shearing job at a time, shearing sort of chose me. At 18 years old, I too was unsure of where life would take me, and what I would end up doing to make a living. I was never afraid of hard work, and I had already been shearing sheep professionally for a couple of years. The important adults in my life had me convinced that shearing could be a good side gig, but would never be enough to live on. By my mid 20s I finally convinced myself and those around me that shearing was enough. The title “Just a sheep shearer” has never bothered me. Some people are a mile wide and an inch deep. If my skill set is only an inch wide, then I will keep pushing as deep as I can go. My interest in sheep and shearing has taken me to a hundreds of farms, in 15 states, and 3 foreign countries. The profession of sheep shearing can vary quite a bit from place to place. The biggest factor is the size of flocks and how spread out the flocks are geographically. In places like Australia and New Zealand, where flocks are often enormous, the most efficient model is through contracting. Someone has to “organize the run”. It ends up being beneficial to both the farmers and shearers to have a middle man. For example, if a farmer has 20,000 sheep that need shearing, they would have a hard time finding the help for this once a year task. So they call a local contractor to sort out the details. Similarly, by working for a contractor, a shearer can count on steady work with plenty sheep. Contractors are often shearers themselves, so they understand the whole process. They will usually provide some amount of training, transportation, as well as lodging and meals. And when asked by the farmer, they also supply the wool handling help. Crews are sent out to jobs, and the entire process is efficient and seemless. Given the amount of sheep shorn in this manner, I would say most shearers in the world are employed by contractors. In the western portion of the USA, flocks can be quite large, so a similar set up as just described, is used. But what about in the northeast where I am from? It’s an entirely different thing. Though a lot of shearers work together on bigger flocks, there is no middle man. There are pros and cons of people like me who are independent. The opportunity for learning is much worse. There are weekend courses which serve as a great introduction to shearing, but are nowhere sufficient for all of what a shearer has to know. The work load of coordinating and scheduling jobs is much more difficult. This means that skills like communication and customer service become very important, and adds a whole new dimension to the job. Also, with smaller flocks that are spread out, I spend lots of time driving. But I do enjoy the human aspect, and I wouldn’t trade the relationships I’ve developed with my customers for anything. Black Walnut trees are found from Canada to Florida. They are found in forests and in neighborhoods. The nuts start dropping in late September and sometimes you can smell the tree before you see it They have a delightful odor. The nuts are covered with a greenish-brown hull. I do not take the walnut out of the husk as the walnut contains tannins which are a mordant helping the dye to adhere to the fiber.. If you are not going to use them for dye right away I suggest you either let them dry out or freeze them. You can also make up the dye solution and freeze it. I prefer to let them dry out. I put them on a baking rack and let them dry naturally. They will turn a dark brown when dried. I then store them in a glass jar for future use. You can also freeze them. I always have an ample supply at the ready.. They can be used many times.
. I let the water cool before adding wet wool, slowly bring it up to a simmer again and after 30-45 minutes bring out your wool. . This dye will work on all sorts of natural fibers. 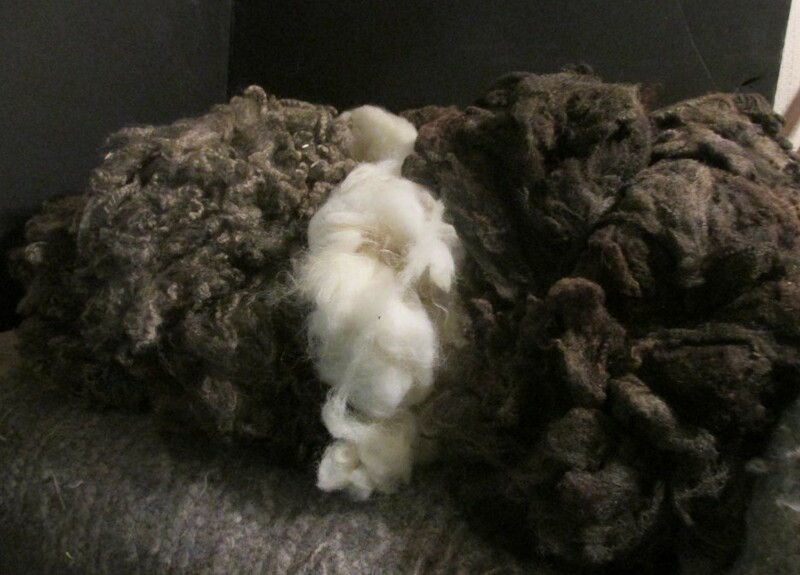 The picture below is of cotton and wool fabric and wool roving. It was left in less than a half hour. If left in the dye pot longer the color will deepen . Adding more hulls to the water will also make the dye darker. I like to over dye plaids with this dye as it give the plaids a primitive look. This dye can also be used to dye and over dye embroidery thread. I am going to put it back in the dye pot in hope to get a little darker color. The big woolen mills are gone, but a number of small custom work spinneries have sprung up to spin yarn for fiber farmers. On the custom weaving page of my website, blanketweave.com, there is a list of some of the ones I have worked with. Whether you keep sheep yourself, or are just looking to source locally grown and processed wool, this list may be useful. Some use old industrial equipment, some use the new Mini Mill equipment. Most spin woolen system and others semi worsted. Where: You will save yourself some expense and trouble if you can drive your wool to the spinnery. This also gives you the opportunity of talking to the spinnery about the best design for your yarn and for them to look at your wool. If the wool is damaged or has too much vegetable matter in it they can tell you right then and there. How much wool: Spinnery minimums range from totally custom (one fleece) to 100 lbs raw fleece to 300 lbs. washed fleece. Costs of spinning at some mills go down dramatically as you have larger quantities spun. Yarn design: Mills spin either woolen or semi worsted system. Woolen yarn is lofty and especially suited for knitting and most weaving. Woolen system mills typically accommodate staple lengths of 2 1/2”-5”. If your wool is longer, you will need to find a mill that spins semi worsted yarn, which will result in a stronger, more lustrous yarn. Scouring: Some mills scour, some don’t. Riteway offers a scouring only service. Green Mountain Spinnery, Zeilingers, Harrisville Designs and Bartlettyarns are woolen system mills that use old industrial equipment. Bartlett has been in operation more than 150 years, Zeilingers has been around since 1910, while Harrisville Designs was started in 1971 and Green Mountain in 1981. All of these do custom spinning as well as selling their own line of yarns. The Hampton Fiber Mill and Still River Mill both spin semi worsted yarn, using modern equipment. There are a number of Mini Mills around; some of the others on my list fall into this category. Mini Mills refers to the Belfast machinery that is designed to serve the needs of alpaca farmers. Because alpaca is long, fine, and needs to be dehaired before spinning, it cannot be spun using conventional woolen equipment. The Belfast Mini Mill is a smaller piece of equipment than the old industrial machines, and they describe it themselves as cottage industry spinning equipment. It reminds me of the spinning jennys of the early 1800s. They sell 4 and 8 spindle models. I will say from my experience that quality of spinning varies widely. Many owners got into the business knowing nothing about spinning, qualities of different fibers, or functions of knitting and weaving yarns. However there are a lot of them all over the country now. Word of mouth recommendations are a good idea. They will process small quantities. If you have wool at one time or another you have had moths. They ruin fleeces and put holes in your clothes. Here are some way to discourage them from making a home in your woolen items. My good friend Lenny passed away in the late 90’s. I was the recipient of her wool yarns and equipment. There were many boxes and in one I found a shirt box. I opened it up and in between tissue paper were four skeins of handspun singles. They were surrounded by Bay leaves. Each skein was tagged with the year it was spun, they were all done in 1948! I think there were two factors here that prevented the moths. There were stored in a cardboard box and the bay leaves.Since that time I have always packed my woolens in bay leaves along with some lavender and other herbs. Moths can also come in with fleeces. Storing the fresh fleeces in paper bags help. ALWAYS inspect new fleeces. A few years ago I bought three beautiful fleeces.It wasn’t until I saw moths flying around my kitchen did I realized that I had an infestation.. Most of the fleece had to be thrown away. Luckily I got it in time as the other fleeces were fine. I immediately washed the rest of the damaged fleece and the other two. Another thing I like to do is add some lavender oil to the final rinse water of fleeces. Be careful not to pour the oil directly on the fleece as it will stain white wool. I have learned this the hard way by ruining a favorite Irish Sweater. I till wear it around the house and have considered dyeing it with black walnut dye. If you have a minor problem with moths you can put the item in the freezer for a week. That will kill them. Be sure and wash thoroughly woolen items that you are going to put away for the warm months. Moths are attracted to any stained clothes. As you can see I do buy Bay Leaves in bulk. I do sell them at shows or you can e-mail me wspines@aol.com for more information. Thanks for joining me today in FIBERuary, I hope that I have helped keep your woolens safe. Green Mountain Spinnery is a cooperatively run woolen spinning mill located in the southeast corner of Vermont. It was founded in 1981 with three goals: creating yarns of the highest quality, supporting regional and breed specific sheep farming, and developing environmentally sound ways to process natural fibers. We work exclusively with US sourced fibers and are one of the only certified organic yarn mills in the country. You can learn a bit more about the founders by listening to Woolful podcast episode 41. David, Claire and Libby share their memories of starting the Spinnery as well as their perspective on how it has evolved over the decades. Today we balance our production between manufacturing yarns for our direct customers and processing fiber for others. Shepherds, dyers and weavers have come to rely on our gained expertise to created finished products that maintain their fibers’ natural characteristics and charms. These custom projects extend the range of fibers that we normally work with in our yarns (wool, alpaca, mohair, cotton and Tencel) to include some unusual fibers such as yak, bison, angora and camel. Our mill resides in a converted gas station just off the northbound exit of I-91. A tour through our facility will give you a unique chance to travel back in time thanks to the vintage machinery used in our manufacturing process. For example, our extractor and several parts of our carding machine are over 100 years old. Maintaining these machines and finding ways to re-use and recycle our fibers and water attests to our ongoing commitment to making our yarns with as minimal an impact on our local environment as possible. And our yarns reflect our passion. As the fiber is transformed from raw material to skein, it is handled and inspected over 20 times. This ensures that there are many of us confirming the quality of our yarns at every step along the way. And this attention to detail is valued by our customers who have come to trust the reliability of our products. We hope that you’ll visit the Spinnery when you are in our corner of New England. We’d love to walk you through our mill and share with you how fiber is transformed into yarn and from there into heirlooms that will be as functional as they are beautiful. Living in a culture that has become removed from its agricultural roots, how does anyone get started in sheep shearing? Some say it’s a calling, which I would not disagree with. But even though I have been a professional shearer for my entire working life, I still find myself explaining exactly what it is I do to ordinary citizens. I can’t say simply, “I’m a shearer”, as perhaps I’d be able to say as an introduction in a place like New Zealand. People who are connected to the sheep world in one way or another, understand the importance of getting the wool from the sheep’s body to the processing stages. These people probably see shearing as an important piece of the equation. Yet, they may not grasp the difficulty of the learning process. I’ve heard it said that it takes a beginner shearer 1,000 sheep to “get the hang of it”, and 10,000 sheep to “be experienced”. Although that sounds daunting to someone trying to learn, I’d even argue those figures are on the low end. There are so many variables to learning, in regards to the learners’ aptitude, the kind of experience available, access to good training, and so on. The challenge of teaching the next generation of shearers is a continuous problem for the sheep industry. Furthermore, most who attempt learning will quit before reaching any of those milestones. As evidence of this, consider that a large number of sheep in the USA are shorn by migrant foreigners. Though much of learning to shear comes down to experience, it is only good quality experience that makes a good shearer. You can practice doing something the wrong way ad nauseum, but you may still be doing it the wrong way. Since shearing is generally piece work, efficiency becomes important. The more efficient you are, the more sheep you’ll shear, with less stress on the sheep. As the old saying goes, “practice makes perfect”. I’d argue that it is more like, “perfect practice makes perfect”. As a 16 year old beginning shearer, I was fortunate enough to start with a few advantages. First, my family had been raising sheep my entire life. Eager to learn every aspect of the family tradition, I started shearing our sheep at about the time I learned to tie my shoes. I was comfortable handling sheep, and knew a few basics of shearing. I watched other shearers at every opportunity, and knew it was something that interested me. “All” I had left to do was learn the technique. Or as a shearer would say, the pattern. But it is a technique which proved to be much more difficult than I realized. Though shearing is sometimes thought of like riding a bike, where once you’ve got it you’re all set, it is actually much more in depth. It takes enormous dedication, and the humility to realize it is a lifelong learning pursuit. Another advantage I had as a youngster was that I already had a large network of sheep friends who were willing to let me practice on their flocks. At 16 I was quite stubborn, and when I picked up my handpiece for the first time, I knew I would never let myself quit. Parts of my training were typical of any beginner. I went to shearing schools, watched videos, talked to experienced shearers, and never turned down opportunities to learn. When I realized I wanted to make it a full time job, I took my training more seriously. I went to New Zealand for a few months, where I sheared with some of the top shearers. A good friend I made in New Zealand went on to become a world record holder. I also made a few other long distance shearing trips in between jobs that were close to home. Besides the shearing skill needed, one of the hardest things is coming to terms with the lifestyle. Even if you don’t travel abroad, and decide to shear locally, the sheep population is very spread out. As a shearer, you learn to have a nomadic lifestyle. One season I looked back and realized that in a period of nine days, I had eight different sleeping arrangements. None of which were my own bed. I have been approached by people who think they want to learn. I would love to be part of someone’s training, yet I am cautious. I need to give them realistic expectations. You will not learn in a day. Or a weekend, or a season. The equipment is expensive. Building clientele takes years. It takes several teachers to learn. Scheduling jobs can become a nightmare, since farmers’ management practices vary. The goal is to spend more time shearing and less time driving, but that does not always work. Being organized, then, is essential. Next to skill, reputation is the biggest asset. So, if you are too eager at the beginning, taking on jobs that are too big or difficult for your skill level, you risk damaging your reputation before you’ve even started. After raising these points, you may be asking, “is trying to learn worth it?” For me, unequivocally yes. I cannot see myself doing anything else. There have been plenty of unenjoyable days; sore backs, misbehaved sheep, etc. But it’s good honest work, you can’t fake it. Whether your boss for the day has one sheep or thousands, they are appreciative of a job well done. There’s a reason they choose to hire a specialist. Maybe it’s all I know, or maybe I’m still like the stubborn 16 year old. Either way, it has been an incredible journey, and I have never found myself looking forward to retirement.